Two bad RRS soundings from opposite corners of the country this evening. Each with strongly super-adiabatic layers aloft. 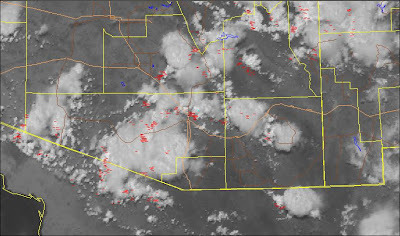 Yesterday was essentially suppressed across all of southeast Arizona, although there were streets of heavy Cu in the southerly flow all afternoon - somewhat unsual for here. 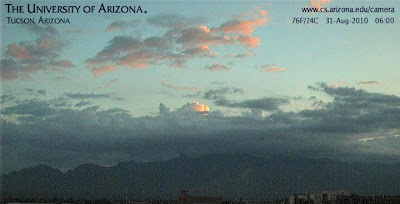 It continues moist in low-levels over the southeast corner of the state, and skies were quite chaotic at sunrise (top image of Catalinas) with heavy Cu, some layered cloud, and even some towers poking up. Mt. Lemmon had 0.04" of precip in last six hours. 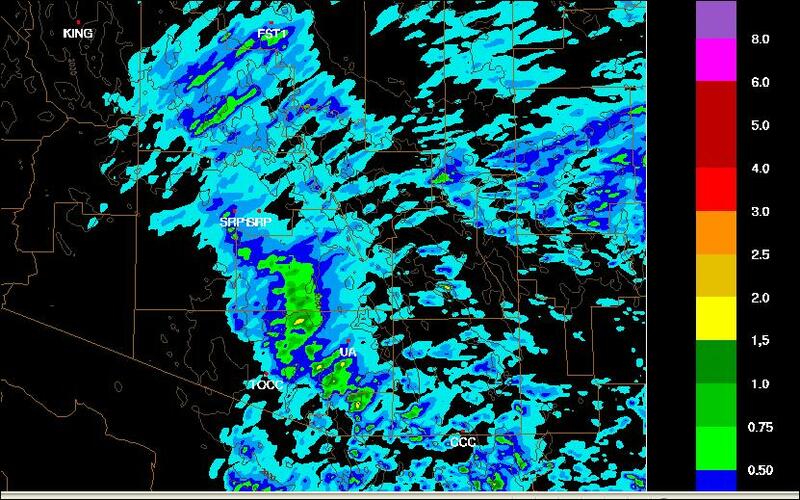 There is a very large gradient in PW between here and Phoenix - TUS has about 33-34 mm while PHX has about 17 mm. It appears that the dryout will push on across southeastern Arizona today as the NAM forecast builds the 500 mb, east Pacific subtropical high inland over the Southwest. The morning sounding (middle image) does indicate some CAPE around early, and so there might be some isolated storms along the Borderlands this afternoon. Although upper-levels are very dry (see WV image at bottom above) over the Southwest, note the very large MCS this morning at the mouth of the GoC, so lower latitudes remain active. The weather attention will continue to be directed to the east where Earl and Fiona will spin by close to the northeast US coast. Was a tough weekend for forecasting: Quite a few severe storms on Saturday with no outlook area or watch, and then an outlook and watch yesterday with one marginal report in state. The NWS POPs were low on Saturday and were just right at 20% yesterday morning, however, by 3 pm the POPs had gone up to 50% for this afternoon and again tonight - but were dropped again at 5:20 pm to 30% for tonight. I thought that Saturday would be like Sunday turned out to be, and way underestimated the storms that occurred on Saturday. We even got a bit of rain here at house on Saturday with a very hostile vertical wind profile! The models were hardly perfect either. Nice weekend example of how even short-term weather forecasting is not yet honed to perfection. Rainfall yesterday - nothing here, no thunder nor any sprinkles. Across the ALERT network 19 of 93 (20% areal coverage) had measurable rain in past 24 hours with almost all of that prior to 7 pm yesterday afternoon. The only regular reporting stations with rain were the 3 most southerly and easterly ones, with Nogales having 0.77" and Douglas coming in with 1.24". Six of the RAWS stations had rain but all amounts were very light. The Tucson morning sounding (top) still seems to have a little CAPE, but it is 4 to 5 mm too wet wrt GPS data. I suspect that as part of the large Pacific tough pulls east today, winds will become more westerly in low levels, leaving the only CAPE off to east and south along border. As for this morning, winds are still fairly strong from the south in the lowest levels - see Marana profiler winds in middle image. The GFS from last night seems to keep this going with all ensemble members having precip over southeast Arizona this afternoon, while the morning NAM has none. The last couple of days the GFS has appeared to be considerably too moist for this area - a confusing turnabout. Finally, the national weather attention this week will focus on Hurricane Earl (bottom image) and the trailing tropical wave. How close will Earl come to the northeast coast and the big megametro areas? Will the trailing wave also become a hurricane? If it does, will it make a landfall in the US? A quick comment on the thunderstorms in southeast Arizona this afternoon so far. The storms have appeared, visually, much less vigorous than were the storms yesterday at this time. The towers that I've observed locally have appeared fuzzy, or soft, and not strongly boiling and bubbling. This kind of appearance can indicate that entrainment is weakening the updrafts. The two top graphics are the visible satellite image and the corresponding TUS radar composite at about 00Z on the 30th. 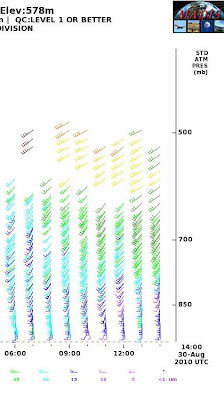 There are some strong radar reflectivities but a check of VILS and storm tops indicates most tops only 30 to 35 thousand feet, with quite low values of VIL. Lightning loops indicate CG activity has been much reduced also this afternoon. The bottom graphic is a special sounding taken at 18Z today at Tucson. The SPC parcel analysis seems to indicate moderate values for CAPE. However, GPS data indicate that the PW indicated is 4 to 5 mm too great - obviously having some kind of impact on sounding diagnostics. Further, the parcel analysis shown is for virtual temperature. It has been my experience that sometimes the Tv diagnostics seem quite optimistic (i.e., high values of CAPE). The classical lifted parcel analysis, even for the too wet data, indicates considerably less CAPE. So, it appears to me that the atmosphere has been acting more like classical diagnostics would indicate and that Tv CAPE was optimistic today. Tough forecasting situation, especially with the bad RRS sounding data. Today is a classic end-of-summer transition day, with lingering low-level moisture, and the strong 500 mb trough approaching. The Tucson morning sounding shows reduced PW today but with substantial CAPE, if lower-based convection can get going. Deep mixing today will dry and stabilize things. The shear profile in the vertical is very Plains-like and and as about as good as it ever gets out here - supercells definitely possible. The SPC has outlooked a possible severe thunderstorms area in central and southeast Arizona (middle graphic). The main forecast issue is whether storms will develop west of the two major metro areas (Phoenix sounding similar to Tucson's) or to the east. The NAM forecasts a squall-like feature in southeast Arizona this afternoon and evening (bottom image for precip through midnight). I tend to think that stroms will be developing just to east of the metro areas, but I was too negative yesterday and will have to watch what happens today. Again, it will be very interesting to see what the U of A versions of WRF model predict! Much more active day than I expected yesterday. As post below shows, the WRF forecasts were closest to what happened, although the storms were most active in eastern Pima County rather than to the west. The NAM seriously under-forecast the activity and had its heaviest precip too far north and east - thus, heaviest rains and storms tended to be in between the two models forecasts in southeast Arizona. 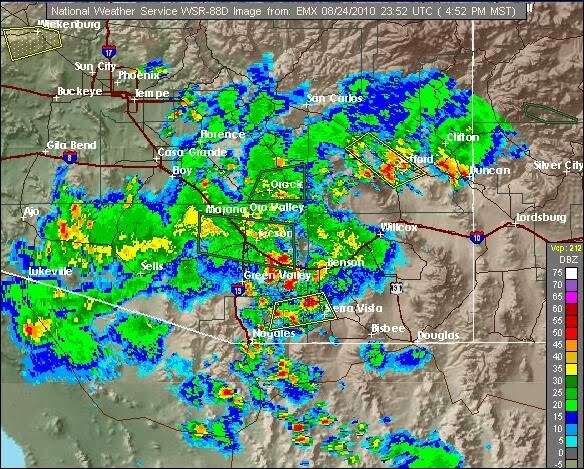 The WRF was clearly superior in the Phoenix area and Mike's outlook seemed right on for the storms up there. So, all-in-all a very interesting day. Pretty much a down day in far east and north of the RIM Country where where dry air mixed to surface. Photos above - view of first storm (about 2:40 pm MST) that formed over the west end of Catalinas early in afternoon. 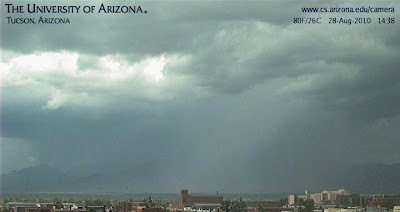 The rain shaft has spread into the higher foothills. Second photo is from the house of a new cell building at 3:35 pm over the foothills just a bit to north. Both of these storms produced lots of thunder here at house but not a drop of rain. Bottom photo is of a lightning strike taken by John Diebold at around 7:30 pm. This view is looking north-northwest from about six miles north of the Desert Museum. 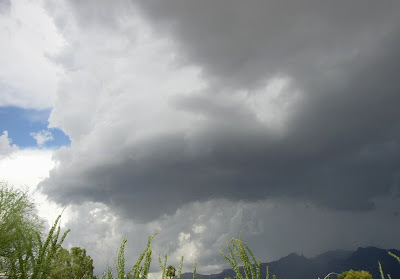 John also reported 0.95" of rain from storms on the west side of Tucson Mountains. Here at the house we had a brief period of rain around 7:15 pm, but a very nice display of in-cloud lightning shooting north from the active cores which were to the south and southeast. Total rain here was only 0.11", one of lowest totals in the metro area. Across the ALERT network (NWS Forecast Zone 33) 54 of the 93 gauges had measurable rain in the 6-hours ending at 7:00 PM last evening with 13 reports greater than half and inch and 4 reports greater than an inch. This morning 63 gauges (65 to 70% areal coverage) have measured rain in past 24-hours and 20 have totals greater than half and inch and 5 gauges had amounts around an inch and a half. DM AFB had 0.61" and a gust to 51 mph and Atmo anemometer had a gust to 60 mph up on the roof there. There were 3 reports of wind damage here in Tucson area, and 3 more in Pinal and Maricopa Counties. Three model forecasts of rainfall (ending around midnight) from this morning's observations are shown above. Areal coverage of rainfall in NAM is much less than the WRF forecasts. NAM forecasts heaviest rains from Tucson off to east and northeast. Almost no activity in north and also west halves of state. Both WRF forecasts indicate heaviest rains west of Tucson in central Pima county (from Baboquivri/Kitt Peaks region east into Avra Valley) stretching north into Maricopa County. Heavier amounts are indicated by the WRF-NAM forecast with a substantial area with amounts great than an inch and a half in central Pima County. Both WRF versions forecast some storms across the northern half of state. Note the extended swaths of heavier rain near and southwest of Flagstaff, indicating that the WRF may be trying to forecast a couple of supercells up there. It is a cool and humid morning here, and I've gotten off to a late start - so a brief overview of yesterday and a summary of the situation today. 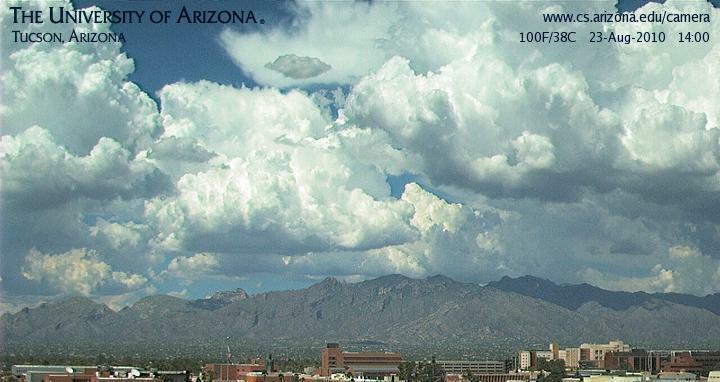 Top photo is from John Diebold and is of a building storm north of the Catalinas yesterday at about noontime. 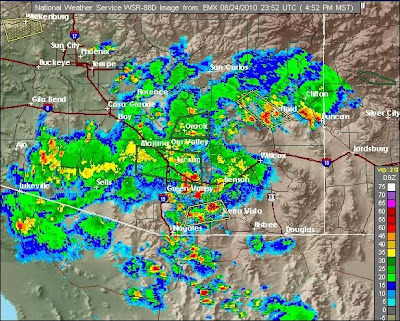 The Tucson metro area was mostly surrounded by large storms yesterday - northwest to south to northeast. A stable outflow moved through the local area a bit after noon, and there was a brief shower here at noon that left 0.01", and that was it for the day, other than anvils. Only 22 of the 93 ALERT gauges had rainfall during past 24-hours (about 25% coverage) and only 4 of these were half an inch or more. White Tail had 1.26" and Anamax way down south had 2.20" to be far and away the heaviest amount I found this morning. Four regular reporting stations had very light amounts under a tenth of an inch. However eight of the higher elevation RAWS gauges had rain - again light amounts except for 0.48" at Sasabe and 1.39" at Carr. Frank fizzled out rapidly yesterday afternoon and became a weak depression that probably won't have much impact, since it will be kept to south by the Pacific troughs now affecting the Southwest. county as storms fire as close as the Rincons/Catalinas. There may be a few isolated towers going up near the high terrain of south central Pima and into adjacent north central Sonora... and I tend to agree. Most of the western US is now completely under the influence of two Pacific troughs, as nicely indicated (for upper troposphere) in the middle water vapor image. The heights at 500 mb this morning, bottom chart - especially if additional contours are added - show that Arizona is completely within the circulation of the two troughs, as do the height contours all the way down to 850 mb. The morning Tucson sounding has small CAPE and westerly flow at all levels except for very near the surface. PWs across southern Arizona are low to upper 30 mms and the trend through the weekend will likely be down. 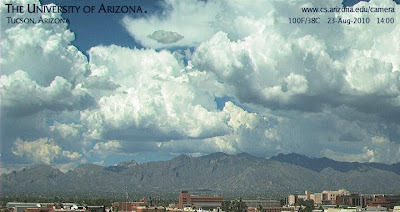 Dewpoints remain high at Yuma and there may be some storms over higher terrain of southwest and south-central Arizona, but most significant storms will likely be over the higher terrain of the east half of the state. So it's a transitional situation today with lingering moisture and relatively strong westerly shear aloft - good setting for some strong storms but less so at low elevations. Interestingly, this morning's NAM forecast shows a local center of heavy precip falling by midnight north and east of Tucson - assume this reflects higher elevation storms. Will be interesting to see the U of A WRF forecasts later this morning. Corfidi at the SPC notes in the latest severe outlook: ....SWLY MID/UPR LVL FLOW WILL BE SUFFICIENT TO SUPPORT A FEW SUSTAINED STORMS/POSSIBLE SUPERCELLS GIVEN SUFFICIENT LOW LVL CONVERGENCE TO PRODUCE STRONG UPDRAFTS. ATTM BELIEVE THIS THREAT WILL BE GREATEST OVER CNTRL/NRN PARTS OF THE STATE LATE THIS AFTN AND EVE...ALONG AND N OF THE RIM. Remains to be seen how much of a monsoon killer this trough will be - the models tend to bounce the 500 mb anticyclone back to west quickly - the ECMWF is the most dismal of the longer range progs tending to keep ridge axis along or south of border. More showers yesterday across much of southern Arizona as the 500 mb vorticity maxima drifted back toward east and northeast. Rainfall was widespread during past 24-hours (about 80% coverage at gauges in southeast Arizona) but amounts were generally light (less than a quarter of an inch). The four stations I found with more than half an inch were: Arivaca with 0.94"; Carr with 0.66"; Sasabe with 0.65"; and Florida Canyon with 0.55". The morning Tucson sounding (top graphic) indicates southwesterly winds at all levels except near the surface. Winds are weak below 300 mb and stronger and more westerly above. Not a good vertical wind profile for many locations. So, while the NAM morning forecast indicates a nice rain event for southeast Arizona through midnight, I'm not optimistic for the house, unless a storm builds right overhead. The sounding is considerably too moist (4 to 6 mm wrt to GPS observations) and PW has been trending downward across southern Arizona during the night. However, the presence of convective clouds west to near the Colorado River certainly indicates the presence of CAPE. Middle level temperatures are the coolest they've been in several weeks, which is a help - hopefully the warmer temps out along west coast will be shunted off to the southwest. Lots of clear skies to the southwest of Tucson, so there'll be much more sunshine today. Thus, today a good chance for storms, especially in locales favored by the southwesterly wind profile. The NAM 500 mb forecast valid at midnight is shown in middle graphic. While Frank is getting a bit far to the west, the pronounced inverted trough to Frank's northeast should help keep an influx of deeper moisture moving northward. The deep 500 mb trough forecast to dig into the west coast on the weekend will probably work in concert with Frank to increase southerly winds. So while tomorrow is uncertain wrt to moisture and CAPE, Sunday appears to have significant potential for strong storms. The shear profile will be a central US variety with strong and veering winds - so a good possibility for a transition type day with more classic severe thunderstorms. Note also that both the westerlies and the tropics are very active - so, since we're in the middle, it's hard to tell very far ahead which features will affect us the most - meaning a wary weather watch is prudent through the weekend. The bottom graphic is the NHC forecast for Frank, indicating that its remnants will move back toward Baja next Monday and Tuesday. That's too far out to know for sure how the Fall-like west coast trough will have behaved - some long-range models minor it out quickly, but we'll have to wait and see what transpires over the weekend. I'll try to cover the most important features that I see affecting southern Arizona through the weekend - I'll resist to the temptation to speculate about the futures of Hurricane Danielle and TS Earl in the Atlantic. Top image shows the rain and storms continuing to increase over south-central Arizona. I see the NWS has amended its forecast to increase the rain POPs to 50% for today and tonight. The morning NAM forecasts a nice rain event in south-central Arizona during the day today, but nothing at all during the night - which seems very suspect! Middle image shows the Tucson morning sounding from the SPC, indicating moderate CAPE aloft in the 800 to 700 mb layer, where winds have a more southerly fetch. The problem with the sounding is that it appears to be seriously too moist wrt GPS observations, which indicate the sounding data have almost 7 mm too much PW. It is virtually impossible to do anything but make guesses about where the sounding data are too moist - regardless, I'll guess that the surface to 800 mb layer is drier than indicated. My guess is based on the ongoing convection and the indicated layer of elevated instability that seem to fit the observed data above 800 mb. Bottom image is this morning's 500 mb analysis from NCAR RAP. 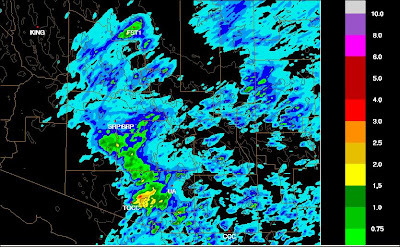 It indicates that the weak 500 mb cyclone, or inverted trough, is located out to the west of Tucson this morning. 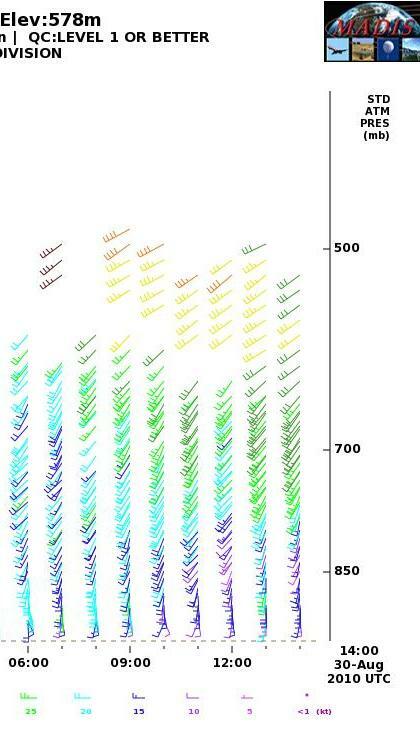 If someone wants a challenging exercise - try to draw a streamline analysis for the observed data! 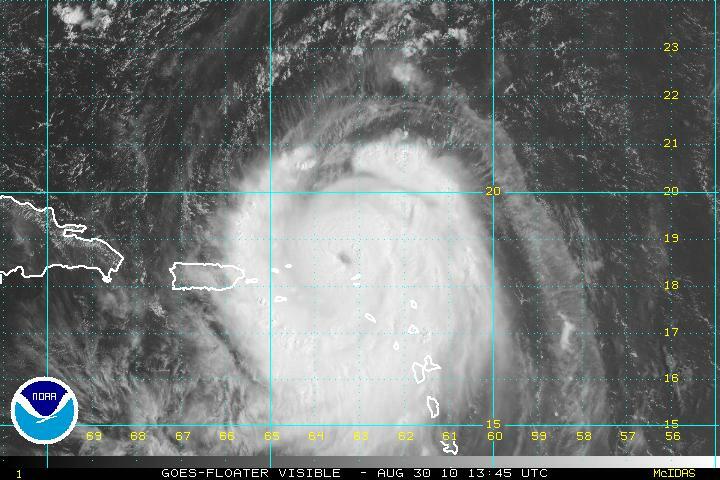 The active convection appears to be occurring in the eastern sector of this feature. The morning NAM forecasts the weak vorticity maxima to drift slowly eastward during the day, ending up nearly overhead by midnight (which is what makes the dry nighttime forecast somewhat suspect). Tomorrow the feature opens up with weak westerly winds as the Pacific trough digs southward. The upper-troposphere (300 and 250 mb) appears to be very difluent today over southeastern Arizona. It appears that the northward push of deep moisture associated with TS Frank (see previous post) will be picked up ahead of the Pacific trough, making for a potentially stormy weekend. Finally, the NAM forecasts indicate that the inverted trough, currently near the Louisiana and Texas border, will intensify into a TD or TS. The model moves this feature westward into northeastern Mexico by 84 hours. So, plenty of ingredients for an interesting four days! Late in the afternoon yesterday thunderstorms had developed off in the highlands southwest of Tucson (see 5:30 pm MST visible satellite image above). 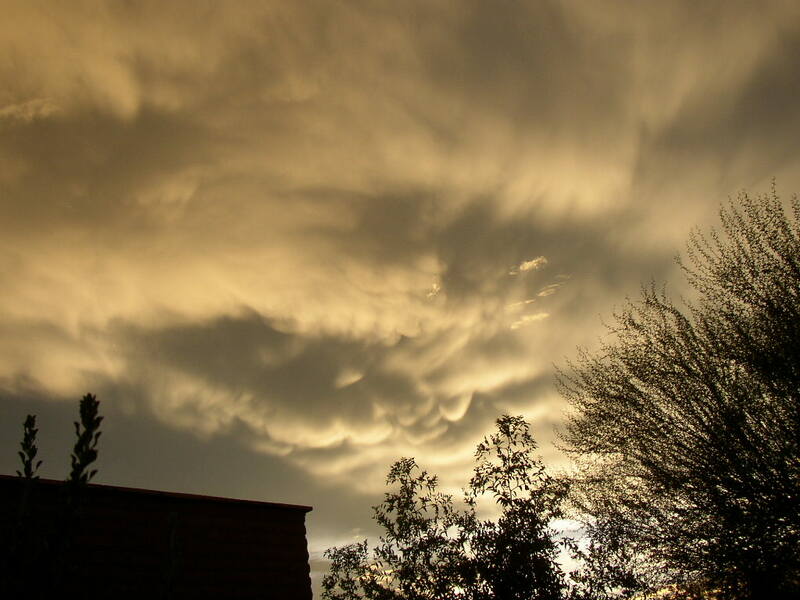 The anvil cloud from these storms spread overhead, as well as a line of building TCU, at dusk. David Monthan AFB had thunder and rain before midnight; however, the surface winds remained strong from the east. The same occurred at the airport in the early morning hours. The lack of wind shifts seems to indicate that these very slow moving storms were rooted in unstable air aloft above the easterly flow associated with the strong backdoor front that had moved through the metro area sometime Tuesday afternoon. Indeed, this morning's sounding seems to show that the storms are being fed from the 800 to 700 mb layer - the more usual scenario for nighttime storms would be that they were associated with various outflow boundaries sloshing around the region. 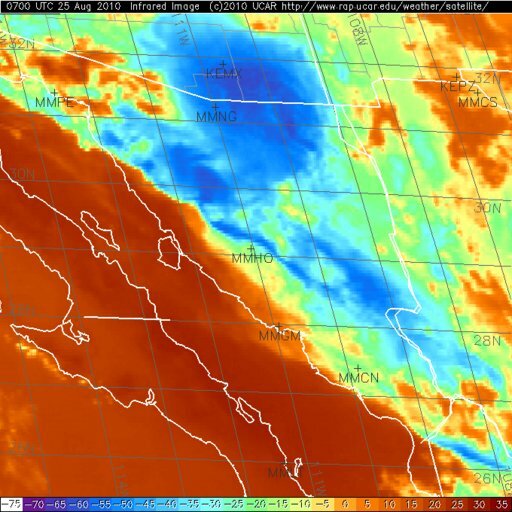 Note that the models were all consistent in forecasting this strong frontal passage 4 to 6 days in advance, and even indicating that it would push westward to the California deserts with moisture and storms (which it did!). Rainfall reports this morning - 0.07" here at house; TUS 0.29"; DM 0,23"; and Nogales 0.01". In the ALERT network 31 of 93 gauges had rainfall during the night with the highest amount being 0.55" at a aguage near Green Valley; and two RAWS gauges to the south of Tucson had rainfall. 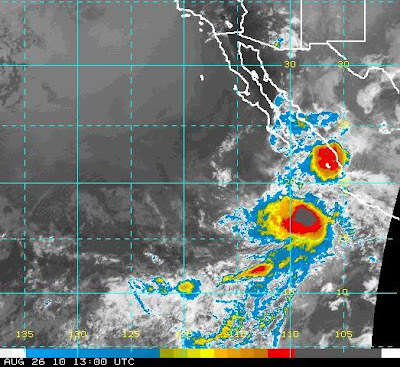 The middle IR image, from this morning, shows TS Frank, a morning MCS at the mouth of the GoC, and deeper cloud pushed up to the middle GoC. The models have been very consistent this week in indicating that the tropical disturbance off Baja would be associated with a nothward push of deep moisture and this appears to be well underway. 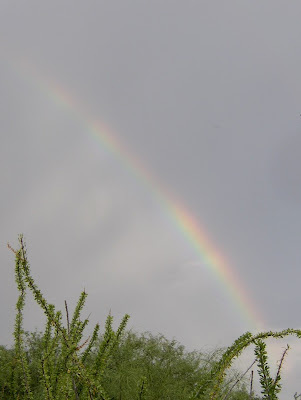 There was a nice morning rainbow (at least half of one) visible from the house this morning at a bit before 7 am MST. I took the bottom photo looking west at the rainbow from the backyard here. Final comment: I've been very puzzled as to why there was almost no mention in the Tucson NWS FDs of the strong cold front coming down the Plains - it was finally mentioned in two discussions but essentially after it had arrived. Similarly, TS Frank has yet to be directly mentioned in any FDs from Tucson. This morning strong easterly winds continue near the surface. The Tucson morning sounding (top) shows an onion shape indicating serious mesoscale contamination. So the nice increase in middle level winds indicated may be due to the MCV that is passing by this morning, and a return to L/V may occur this afternoon (the Marana profiler already shows a weakening of the middle level winds). The Ft. Huachuca wind profiler indicates strong southeasterly low-level winds, with the flow becoming westerly at 500 mb. So, a chopped up pattern with several smaller scale features wandering around that aren't captured in the larger-scale analyses (see 500 mb chart middle). The 500 mb NAM forecast indicates another weak shortwave around southeast Arizona this evening, with the more pronounced one translated out to western part of the state. Surface dewpoints are much lower across the border in New Mexico. I am going to assume that the downslope winds will prevail today and that storms, if any, will be on higher mountains, as the lower levels dry out some. Tropical storm Frank has strengthened some (see bottom image) and is expected to become a hurricane today. Frank's track is forecast to take the storm up southwest of the tip of Baja, and then it will begin interacting with the next Pacific trough. Both the GFS and ECMWF are now forecasting that the trough will come ashore and not pick up Frank, leaving it to head west out into the Pacific. We should keep a close eye on Frank's track the next several day's. Since I feel quite snakebit, I'll keep an eye on the cloud masses still to our east and south and try to follow the mescale swirls during the day today. As I wrote below, the events of yesterday afternoon, and then on until midnight or so, far exceeded what I expected. The interaction of numerous outflows with the strong easterly low-level flow/backdoor front easily trumped the light and variable winds aloft. This appears to be a very unusual event - worthy of careful study, since it exceeded what any of the models or human forecasters indicated. Rainfall update - this morning 83 of the 93 ALERT stations had rainfall in past 24-hours with 11 sites having amounts over an inch. The reporting stations show that Ft. Huachuca had 1.55" and Tucson airport 1.21". Ten RAWS stations had rainfall with Empire, Columbine, and Rincon each reporting over an inch, but Carr measured an amazing 3.56". Having recently been up the Carr Canyon Road with Art, I can vividly imagine what the runoff flooding was like! The IR satellite image at top is from 2330z on the 24th - note that: There is a small, strong MCS in northwestern Cochise County and several storms were building in northern Mexico. Apparently different outflows converged in southwestern Cochise County, so that by 0700z on the 25th (bottom) there was a single, weakening MCS centered over the region of heaviest rains. Art reports 1.68". Meanwhile, here at house we received only 0.19" as the heavy storms went up and down just to the south of here. The rain amount at TUS yesterday exceed our entire total for the month so far here at the house! Much Better Storm Event Than I Expected! East winds set in around 11 am to noon; temperatures shot up to around 105F; and slow moving storms developed all around the metro area. Much better coverage than I'd expected with the east winds, which usually leads to storms to the west of Tucson metro area. there were also many more wind damage reports across southern Arizona than I would have anticipated with no winds above the boundary layer. So, to me, a surprising day. Top image shows lightning CGs around 2:50 pm, as we were having a nasty electrical storm here at house, but not much rain (total here only 0.12"). Steve Mullen, who was only about a mile away, reported urban flooding and at least an inch of rain near Campbell and Ft. Lowell at about this time. Middle image shows Tucson radar composite chart at 4:52 pm this afternoon. Bottom image shows the rainy view looking north from campus at 5 pm (all times MST). At 5 pm a scan of the ALERT gauges showed 57 of 93 gauges with rain in last six hours - so about 60% coverage during the day - again, far more than I'd expected. Amounts were all over the place, but two gauges had just over an inch. The surface front that I've been writing about the last few days appears to be coming into play here a bit sooner than I'd anticipated. This will make the evolution of the day quite dependent upon the timing and the strength of the downslope flow between here and the Continental Divide. The Tucson morning sounding (top graphic) continues to have a pathetic vertical wind profile, and this morning's NAM progs don't improve it much during the coming 18 hours. It also appears that CAPE has diminshed considerably, because of the somewhat dry layer from 850 to 700 mb - and this before we'd try to figure out what part of the sounding is too moist (comparision between GPS and sounding PW shows the sounding more than 3 mm too wet). Middle data plot is surface chart for 1400z this morning. A large area of 24-hour pressure rises of more than 15 mb was present from north-central Nebraska southwestward across eastern Colorado, with max rises right at 20 mb around Pueblo. It appears that the front may have just passed Demning, New Mexico, at the time of the plot, meaning that it is about to come over the Divide. There is a large cloud mass covering almost all of New Mexico this morning, and extending into southeast Arizona. The bottom chart is the NAM 850 mb forecast for midnight tonight. The forecast indicates that by that time the front has pushed westward across almost all of southern Arizona. With strong downslope winds occurring across southeast Arizona. The NAM forecasts strongest winds in the troposphere to be the near-surface, post-frontal winds - not at all a good shear setting for organized storms. Thus, my first look at the morning data leads me to conclude that things will not quite manage to come together to produce a big storm day locally. However, the positives I do see are that there does appear to be a weak piece of the shortwave trough moving westward across southern Arizona and that the steering winds do become northeasterly, albeit very light. the timing of the front is of course very critical and probably the factor that will dominate today's weather outcomes. Storms yesterday, given that winds aloft through the troposphere became nearly calm during the afternoon, were very much classic single pulse, with rapid growth, heavy rain out, and orphan anvil. 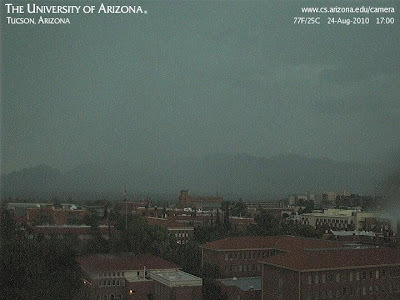 Top image is 2 pm view from Computer Science webcam showing building towers over the Catalinas. Bottom photo from John Diebold - taken a bit after 4 pm looking northwest from Shannon and Ina toward Marana. So, brief, local heavy storms (see also image in previous post looking south from Kitt Peak), most on higher terrain, but a few building out in the desert. Here at the house we had thunder from a short-lived storm that built in the foothills just off to the northeast - not a drop of rain. The heavy rainshafts mostly avoided any gauges, so areal coverage was quite restricted. In the ALERT netwrok 10 sites had rainfall during the afternoon when I checked at 5 pm - only 2 more picked up rain after 5 pm. Amounts were light except for 0.79" at Altar Wash in the six hours ending at 5 pm. None of the routine reporting stations had rain, although several had thunder. Seven of the RAWS stations in southeast Arizona had very light rain (less than a tenth of an inch except for 0.29" at Rincon). So a day with moderate instability, good sunshine and very light winds aloft - could have been a much better day. So it goes this summer. First - Top image from Kitt Peak looking south about an hour ago - note the three distinct showers: light right; moderate middle; and heavy left. Art sent along the two forecast graphics. The middle image is the NAM model's forecast meteogram for Ft. Huachuca, indicating the strong passage of the backdoor front from the east during early am hours of Wednesday. The bottom is the GFS ensemble members' forecast of the track of Tropical Storm (forecast to become a hurricane by NHC) Frank. So it will be interesting to watch as these two features evolve and affect southeast Arizona during next few days. Top photo shows heavy anvil and mammatus at sunset yesterday, which was as good as it got yesterday. Was mostly a down day across southeastern Arizona. Storms generally on high mountains, with anvils overspreading lower elevations. A bad wind profile to start the day got worse by evening. Across the Pima County ALERT network 14 of 93 stations had measurable rainfall in past 24-hours. One reporting station and four RAWS stations also had light rainfall. The only signficant amount I found was 1.22" at Florida Canyon yesterday afternoon. Looks like coverage was at most 10% yesterday across southeast Arizona, probably less. Have an appointment this morning and so here's my quick assessment of things. Really bad wind profile today with southwesterly or light and variable through troposphere (see Tucson morning sounding middle); PW down some into middle 30s mm, but sounding seems much more wet than that and is suspect I guess that we'll have small to moderate CAPE this afternoon (note that Wyoming and SPC sounding plots only have partial data, so something seems awry) Edited at 11:30 to add : Back from appointment and have taken a closer look at Tucson sounding and PW. The sounding appears to have a bit more than 40 mm of PW and is only about 2 mm too wet. The PW data I looked at at Atmo time series page this morning was probably old, and I didn't notice that. Atmo is apparently totally down this morning, since I can't get at their page now and there are no e-mails from Leuthold; tail end of western trough at 500 mb (see bottom image) stalls over Arizona, leaving us with a stagnant large-scale setting. So, mountain storms try to drift off mostly toward north slopes. Don't expect anything here at house unless a cell would develop right overhead. In longer-term this week it still looks like a backdoor front event early am on Wednesday. Longer range models bring Frank up our way toward end of week. But, they also show a monsoon-busting deep trough at 500 mb digging into the west coast. Brief Summary of July and Misc.